Are you planning a laundry room remodel? 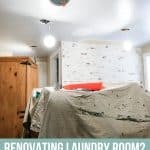 Then, you’ve gotta read this post with 8 things to consider when planning laundry renovations! 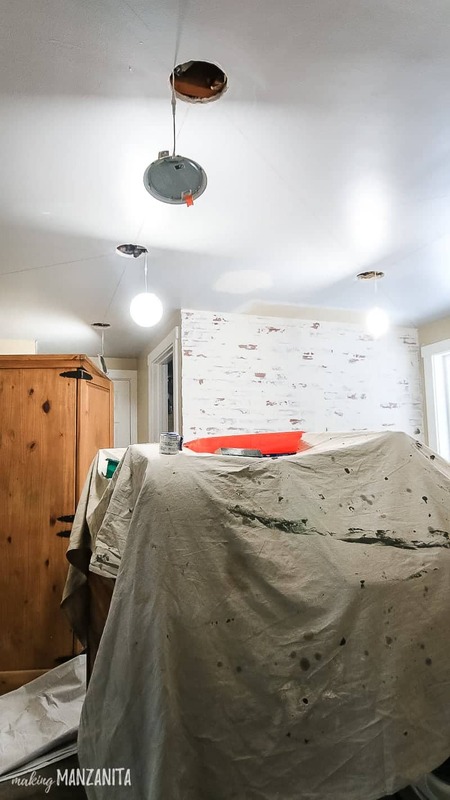 If you follow along on Instagram, you may have seen some progress on our latest renovation project that we’re tackling next…the laundry room! Next week, I’ve got the full design board for you to see all of our plans. But today you’re getting some MAJOR sneak peeks of our progress so far! The day we started working on the laundry room, Logan looked at me and said, “This is awesome, this project is really fun!” and I agreed. 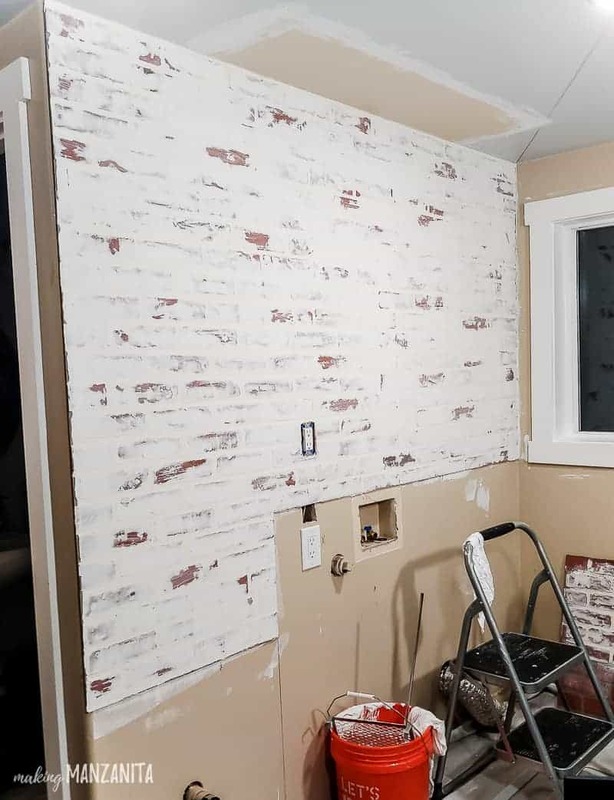 When we started it, we had about 3 feet of snow outside and were starting to feel a little stir crazy, but nothing that a little renovation project couldn’t fix! It seems like every time we start a new project over here, there’s new excitement in the air. Are you guys the same way? If you know anything about the way Logan and I renovate (or really do anything in life), you know that we’re “serial over-thinkers”. We’re not very spontaneous when it comes to renovating, which I guess is a good thing. This means that every project that we take on has been planned out well in advance. To be honest, before we jump into anything, we’ve already been talking about it for months. 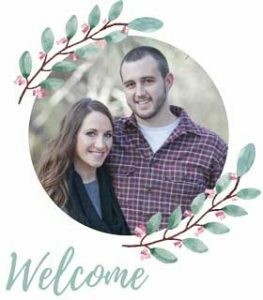 We’ve already collected inspiration, determined the design choices, and talked through how we will tackle the DIY projects together. Most importantly, talked about what things we need to consider during this specific renovation process. 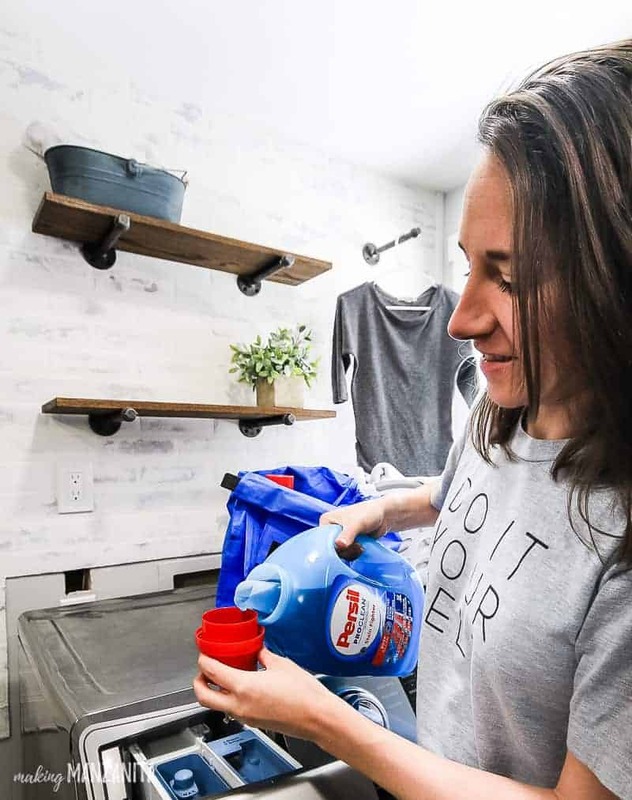 Since we started using Persil laundry detergent, I can honestly say that I’m not bummed out when I have to do laundry (that’s really sayin’ something coming from someone who really doesn’t like to do the laundry!). This stuff smells AH-MAZING. 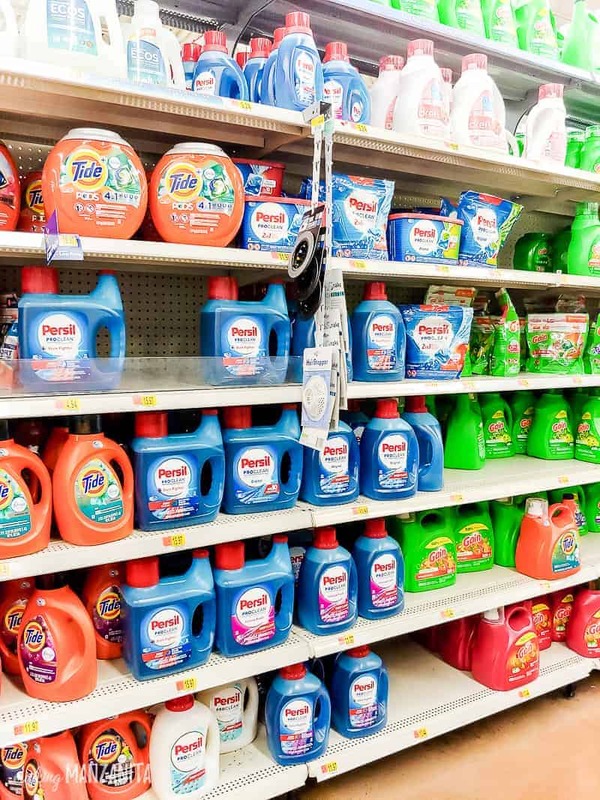 Persil laundry detergent is kicking off a Deep Clean Challenge (Spring Cleaning, anyone?) and there’s a chance to win some seriously great prizes, including your own laundry room makeover! Score! Sign up for the Deep Clean Challenge Sweepstakes here. 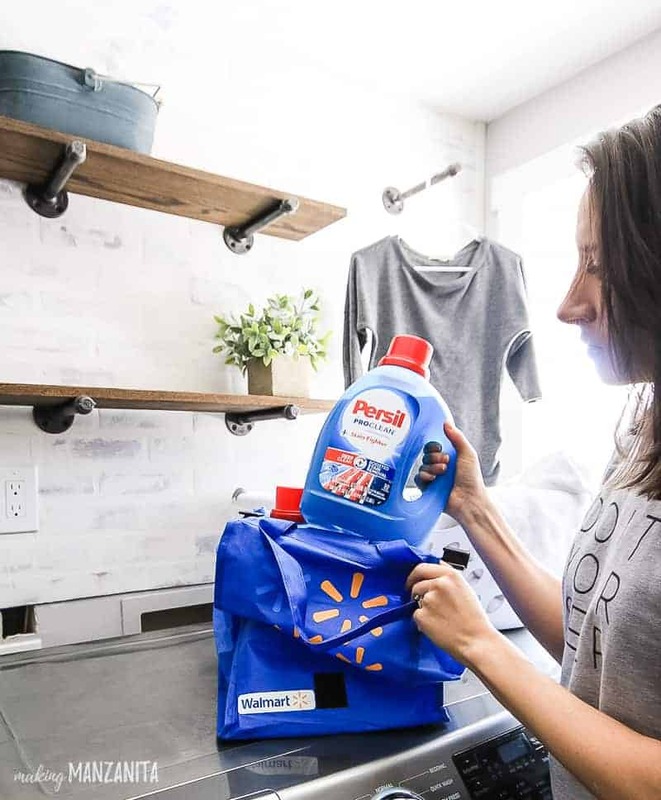 They are also hosting Experience Deep Clean Day with Persil® ProClean® laundry detergent events at some Walmart locations. You can check to see if there is one happening near you here. 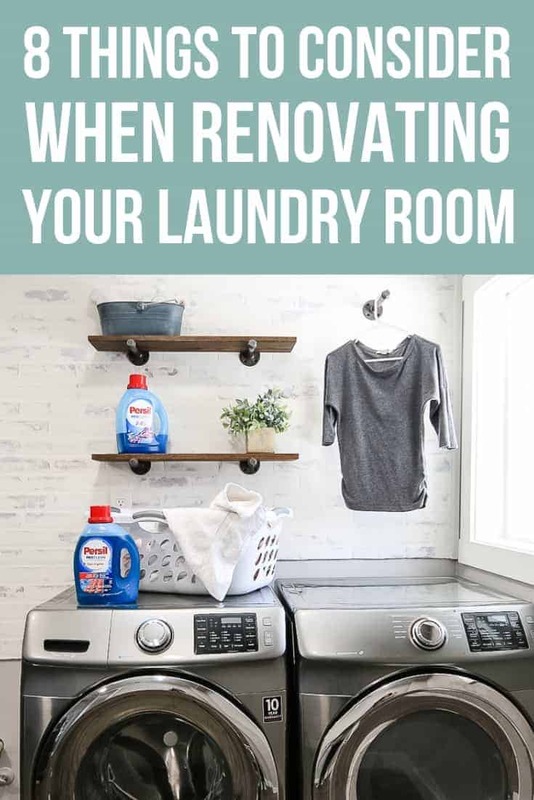 Now, while you are crossing all of your fingers and toes hoping you win a laundry room makeover (my fingers are crossed for you too, by the way), let’s dive into those things you need to consider when planning laundry renovations – sound good? If your laundry renovations are pretty intensive, there is a good chance that you may be without your washer and dryer for a while. It is helpful to know approximately how long that is going to be before you “pull the plug”. If it’s going to be a while, you should also make a plan for where and how you will do laundry in the meantime. If you have the space for it, there is nothing better than having a sink in your laundry room. We were so stoked when we saw that the plumbing for a utility sink was all ready to go in the wall. The next step in our laundry room remodel is to build a cabinet to hold a beautiful farmhouse sink and add a faucet that has a pull-down spout. The convenience of having a sink right there is going to make a world of difference! Do you have a place to fold clothes? 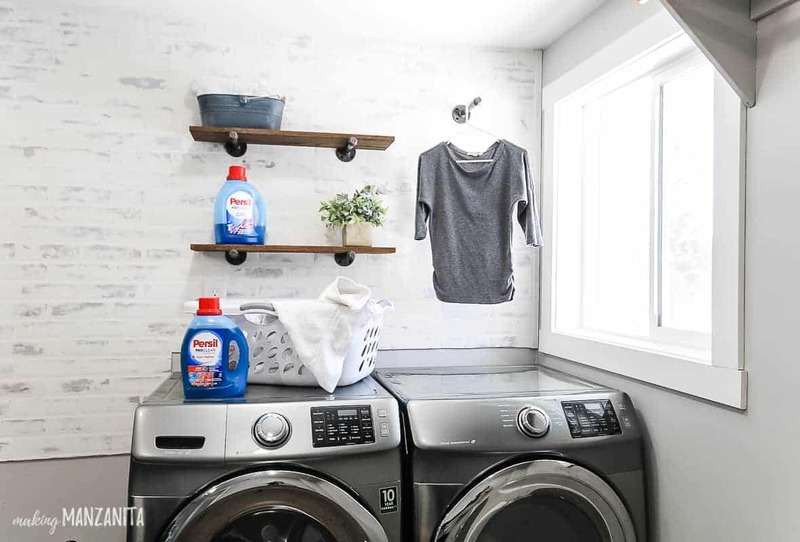 Having easy access to your most used laundry supplies is KEY for an efficient laundry room. 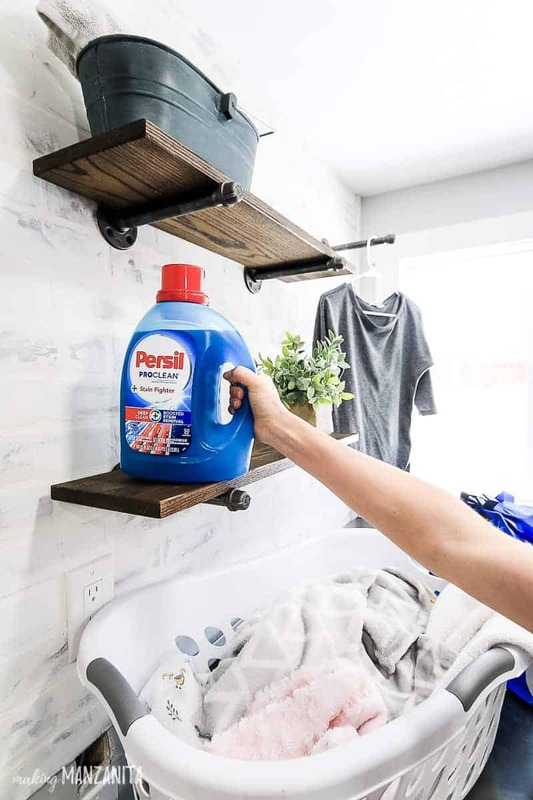 We added these floating shelves for storage which will serve as storage for some cleaning supplies in baskets and a good place to put the laundry detergent. Let’s be honest – I’m also going to have fun decorating these shelves. No one loves to do laundry (ok…well, no one I KNOW). But laundry can be less annoying if you have a beautiful place to do it. 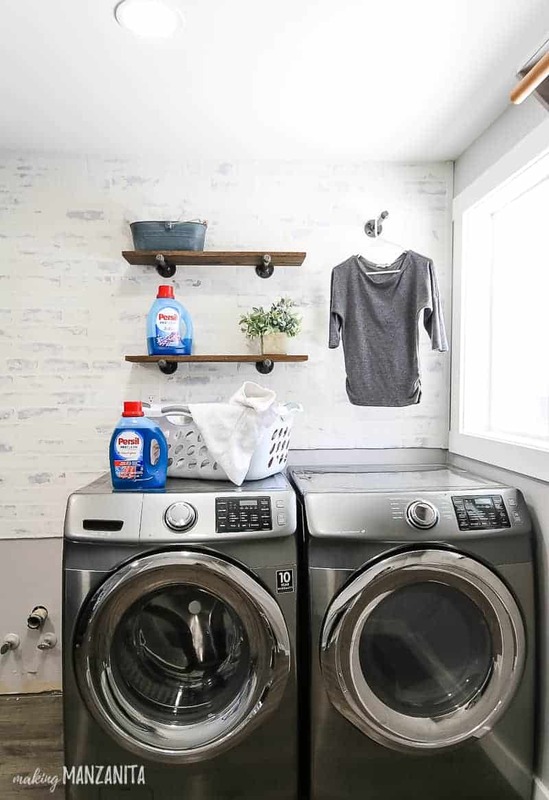 If you’re going to be doing a laundry renovation, don’t forget about incorporating some fun design elements for no other reason than it makes it look pretty. Was there anything wrong with the wall before? Nope, it was just fine. But that faux brick wall makes the room beautiful and I smile every time I walk into the room now. 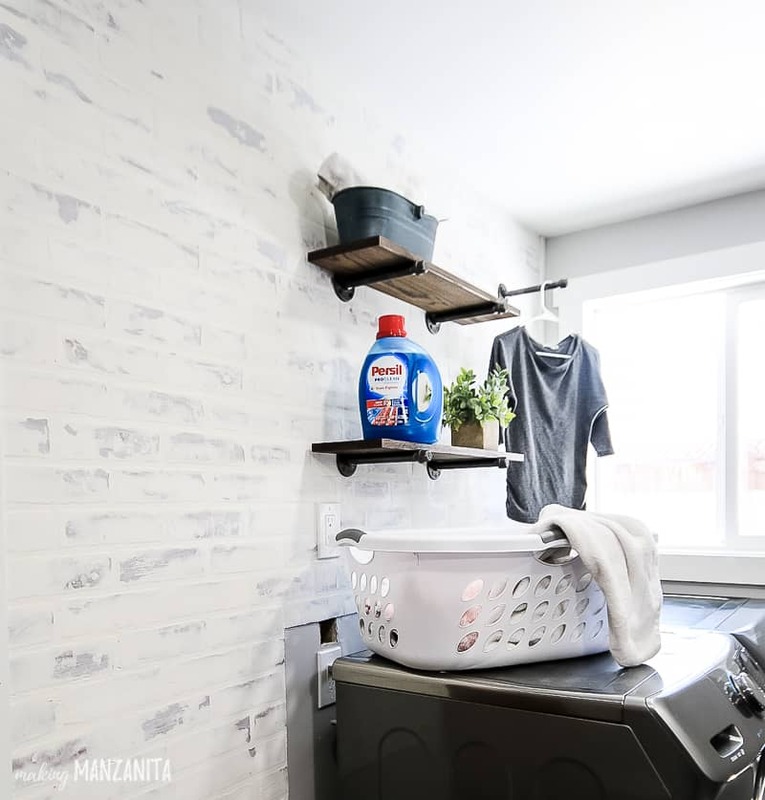 If you’re planning a laundry room remodel, these 8 things should be considered before you dive right into laundry renovations. 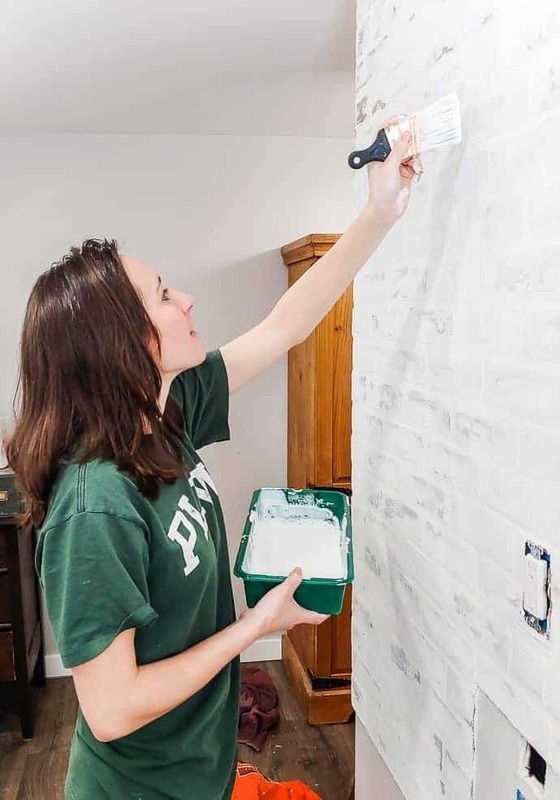 It is important to plan a few things out, like where you will do laundry while yours is out of commission and what you will hire out versus DIY. If you can swing it, try to incorporate a sink with a pull-down spout/faucet, an area to fold clothes and a place to store laundry supplies. Now that we’re well into these laundry renovations, I’m so excited to get it finished and share it all with you! Don’t worry the tutorials for the faux brick wall & floating shelves shown here are coming up later this month! Have you ever done a laundry room remodel? Tell us how it went below in the comments!